We are the first company to develop and introduce SAW or surface acoustic wave sensor scales to the international market. This new technology has revolutionized quantification of materials as sensitive as gases and ultraviolet radiation, which makes SAWs an ideal process for the precise weighing of materials of all kinds. 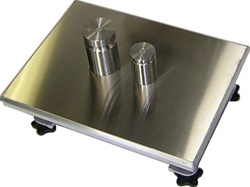 The affordability of our Ultra Precision Scales is comparable to strain gauge scales. We are proud to introduce you to SAW technology for the weighing of your products. The precision of SAW scales enables you to eliminate waste and measure exactly what you need, when you need it. Surface acoustic wave sensors or SAW sensors produce highly accurate data for a variety of applications. Advances in technology allow SAW sensors to be manufactured affordably and made available for many industries. SAW sensors belong to a class of devices known as micro electromechanical systems or MEMS. The general public has become accustomed to using MEMS for applications such as water faucets that turn on when they detect motion. Thanks to the manufacturing processes used to produce motion-sensitive faucets, it is also possible to manufacture SAW sensors using the same micro fabrication techniques. SAW sensors work because they are able to use something called the piezoelectric effect. The piezoelectric effect is created when inter digitized transducers (IDTs) take electrical impulses and change them into acoustic waves. IDTs are arranged at opposite ends of the measuring device. The acoustic wave travels between the two IDTs, which then change the wave back into an electrical signal. The acoustic wave is sensitive to whatever has been placed on the surface of the device. As a result, the properties of the wave change as it encounters the substance it is meant to quantify or measure. It is these changes in the acoustic wave that yield data that can be used in a variety of applications. The data from the acoustic wave is so sensitive it can be adapted to measure gases, bacteria and viruses, and even ultraviolet radiation. SAW sensors need to be constructed of particular materials in order to take advantage of the piezoelectric phenomena. Only a few materials produce this effect. Crystal is mandatory. It can handle heavy loads easily, but cannot survive impact due to its brittleness. The crystal conducting surface is referred to as the substrate. This must be thin enough to make a small and light sensor yet tough enough to withstand whatever substances the device will need to quantify. Quartz, Lithium crystals and Langasite are often used as the substrate for many SAW sensors. IDTs are made of copper, aluminum, titanium, tungsten and gold. The IDT material must be capable of conducting electricity and able to be melted at a particular temperature. The IDT layer is applied to the crystal substrate using heat. The desired pattern is etched from the IDT after a photo-resistant layer with a grid has been applied. More IDT material is laid on top of the photo-resistant layer. All excess IDT is removed along with the photo-resistant layer during the final process until only the desired IDT material remains. When SAW sensors measure mass with industrial scales, the velocity of the acoustic wave decreases as it encounters the material it is measuring. This change in velocity is measured as a time-delay that can be observed between the input and the output signals. In other words, the scale measures the reduction in the waveÕs energy. This time delay is exact. It is much more accurate than an actual weight on a conventional scale. Remember, this acoustic wave can detect the nature of bacteria or something as light as gas. The readings from a SAW scale are extremely scientific and more accurate than any scale previously invented. In actual numbers the accuracy of a SAW scale is in the 1:100,000 to 1:200,000 ranges. Accuracy of these scales has been measured at 0.005% with a display resolution up to one part in 400,000. Internal resolution is as high as one part in two million! We offer SAW bench scales that range from 10 to 200 pound capacities. Platform SAW scales can take on additional weights from 200 to 1,000 pounds. Recent advances now allow the SAW scales to take on as much as 5,000 pounds. These amazing scales provide twenty times more accuracy than outmoded strain gauge scale technology. The highly sensitive acoustic wave sensor delivers its piezoelectric punch not as hardware, but as technology. Therefore, its sensitivity and precision are not prone to error or breaking parts. The rock hard substrate with IDT metal is manufactured to endure any weight your industry might demand. The extremely rigid cell block is built to take large loads. In fact, SAW scales can take twice the load and twice the shock of any previous scale. Our ultra precision scales are backed by a three-year warranty and are made to last. The scales are constructed of a die-cast aluminum shell with a stainless steel weighing pan and toggle switches. These scales offer easy-to-see large, back-lit LCD dual display with multiple weight units. There are parts counting and check weighing functions, as well as automatic zero tracking and stability control. Computer enhancement options include RS-232 and Ethernet. There is a rechargeable battery pack and set-point controller for automatic filling, and other upgrades. SAW scales require no professional set up. You can easily start using the scale immediately, and no calibration is necessary. You get all this for less than the price of a high-end strain gauge scale or for a fraction of the cost of a force restoration scale. Our Ultra Precision Scales can take you into the world of high technology and high precision today. ItÕs about time to make an investment in a scale that will deliver tomorrowÕs accuracy today and into the future. Our Ultra Precision Scales deliver elegance in a powerhouse package. For further information any questions, please do not hesitate to contact us.